After six years of development and numerous time studies, Brilliance Wipes unique non-toxic properties have revolutionized the cleaning of stainless steel, chrome, laminate and wood surfaces. The biodegradable cloth wipe with the natural organic formula cleans and polishes surfaces leaving a protective coating against smudging, markings and fingerprints. Brilliance non-water-based wipes are re-usable and will not dry out. They clean up to 100 square feet of surface area, making Brilliance an economical choice. The residual effects of the formula eliminate daily cleaning of stainless-steel surfaces to a cleaning regiment of every three to five days. EZ Dock® introduced the next generation of personal watercraft lifts to support the growing size and weight of PWCs with the patent-pending EZ Port MAXTM . The EZ Port MAX supports these craft through a higher and wider hull "cradle" and integrating a unique, oversized universal patent-pending roller system to provide the rider(s) easy launching and retrieval of their PWC. The EZ Port MAX can be used in an in-line fashion to maximize usable space. Atria Commercial Pool Enclosures are green and friendly to the environment, as well as saving energy and dollars for commercial facilities. Atria's light-transmitting insulated polycarbonate roof glazing provides passive solar energy. The enclosure keeps pool water clean, requiring less vacuuming, and assists in maintaining water temperature, letting the pool's heating system run less. Enclosed pools have less evaporation from wind and sun, requiring less additional water for appropriate depth. Less chemicals are needed, as the chemicals don't dissipate as quickly from wind, sun or debris. Atria glazed, rigid-frame aluminum enclosures are constructed from materials not affected by humidity and chemicals, requiring minimum maintenance. With the introduction of the Reform BarTM , Power Systems gives personal trainers a new way to provide their clients with a Pilates workout, without requiring heavy equipment or a studio. The new Reform BarTM enables users to perform Reformer-style movements with one simple piece of equipment. Because it's lightweight and disassembles easily to fit in its own carry bag, it is an ideal tool for travel. The Reform BarTM consists of a 39-inch padded bar with two 30-inch resistance tubes attached to each side. Users slide their feet into two attached Velcro-adjustable cuffs to perform different movements. The Reform BarTM comes in light or extra-light resistance to suit different levels of users. With the growing concern about the environmental effects of discarded plastic water bottles, the new Voyager MVP Hands-Free Water Cooler with Filter Life Indicator provides an ideal alternative for safe, clean water. 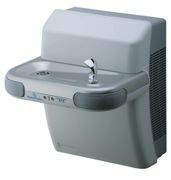 Once the electronic eye sensor determines that someone has approached for a drink, the cooler immediately begins to dispense water, allowing for hygienic operation. A built-in safeguard shuts off the stream after 30 seconds. The Voyager MVP is equipped with the Aqua Sentry filter to reduce the unpleasant taste and odor associated with sediment and chlorine while also decreasing harmful contaminants. A Filter Life Indicator indicates when a replacement is needed. Fitness Anywhere Inc. has released two new programs that demonstrate the versatility of the TRX Suspension TrainerTM . The TRX is the original bodyweight-based, performance training tool that delivers a total-body workout yet is completely portable and can be used almost anywhere. Each package includes a full-featured DVD and a comprehensive, full-color printed exercise guide. TRX® Biomechanics: Healthy Back focuses on how to build back strength, alignment, flexibility and range of motion to improve performance and reduce the chance for injury. TRX® Performance: Tennis features a 40-minute workout with cardio drills designed to mimic actual tennis strokes and footwork. Pentair Water Commercial Pool and AquaticsTM has introduced a new variable frequency drive designed to save energy and operating costs of pumps for commercial aquatic facilities. The Acu DriveTM XS offers increased pump performance in all aquatic pump applications that results in energy savings up to 98 percent. Specified to save energy, space, costs and time, the Acu DriveTM XS is built to be the heart of the pump room. With minimal payback time, it is designed for automatic energy optimization and even offers a built-in display that shows the time remaining until the drive pays for itself. SeaKlear® is now offering Thick Tile & Vinyl Cleaner, designed for pools, spas and hot tubs. Designed to remove film, oil and scum lines from swimming pool tile and grout as vinyl tile borders. SeaKlear Thick Tile & Vinyl Cleaner is non-abrasive yet still cleans deep down into pores to effectively remove tough soils. Safe for use on acrylic surfaces, the product is ideal for spas and hot tubs. Available in convenient quart size for service professionals or do-it-yourself homeowners.